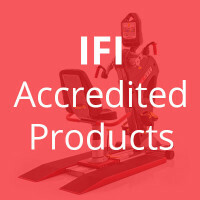 Iso-Strength is the exclusive strength program featured on SCIFIT products. 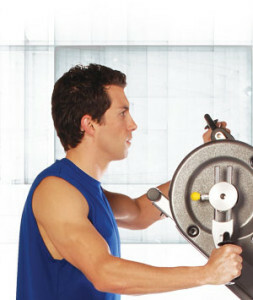 This program provides the user a strength option using a cardio movement. Iso-Strength is a safe, functional strength program in which the resistance matches the user’s effort. Safe resistance training without intimidating, cumbersome weights. Uses the same rotary motion as the cardio portion of the exercise (bike, upper body, elliptical, etc.) so there is no learning curve. The Iso-Strength exercise does not have an eccentric or negative component. Relatively little or no muscle soreness is experienced after a concentric-only exercise session. It is the eccentric portion of the exercise that creates the majority of the soreness. This isokinetic component mirrors the force applied by the end user, adapting for individual weakness within the range of motion. Also, as the user begins to feel fatigued, the resistance automatically decreases, accommodating each user’s level of capability. If you increase the RPM setting, it does not decrease the resistance level. It only increases the speed at which you must pedal or turn the crank to get resistance. Therefore, to decrease resistance, pedal slower. For maximum resistance, attempt to pedal faster than the RPM setting. The machine will not allow you to pedal any faster. So, the harder you try, the more resistance is generated, creating a strength exercise. This is known as accommodating resistance. Iso-Strength allows for short intervals of intense, all-out effort alternating with intervals of minimum intensity, called interval training. It is feasible because Iso-Strength provides variable resistance. This cannot be accomplished with a traditional weight device, which only provides constant resistance. A dumbbell or barbell provides constants resistance, which is an undesirable feature for optimal results. For example, if an individual has the strength to lift 149 pounds and the weight is 150 pounds, the individual is unable to accomplish the movement without decreasing the weight.